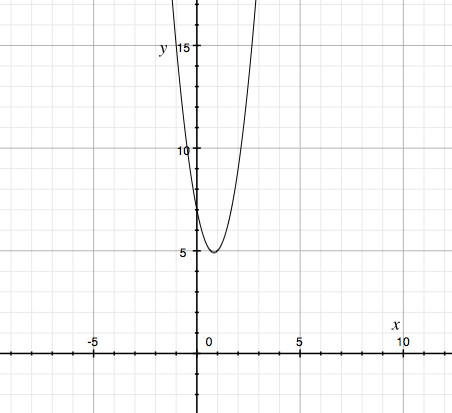 We can now easily acknowledge the slope is equal to -4, and the y-intercept is equation to 13. To find the x-intercept, we must set y = 0 and isolate x. Remember that to find an equation of a linear line, we need a set of points and a slope. We are given a set of points, but we will need the slope. We can acquire that with the given equation. Let's first convert it to y = mx + b form to extract the slope. We can now see that the slope is equal to 4. Similarly to question 1, we can now expand the equation out to get y = mx + b form. Alternatively, you could also not use point-intercept form at all, but rather use slope-intercept form to solve for the y-intercept and plug the values in directly to the equation. Now that we know b = 13/2, and m = -1/4, we can put those directly into y = mx + b to receive the exact same answer. The quadratic formula is necessary for this question because it cannot be factored by breaking up the term containing x. Thus, there are no factors of ac which their sum equals to b. The problem is there is a negative value under the square-root/radical. Because of this, there are zero x-intercepts. Then there are no x-intercepts as the value under a radical cannot be less than 0 or it will result in an imaginary number. Then there is exactly one x-intercept as x = 0. Note that some texts may state there being "two equal roots", but this means the same thing as 0 = 0. Then there are exactly two x-intercepts. We already concluded our original quadratic function has no x-intercepts however. Moving on to y-intercepts, we will let x = 0. This is usually easy as the y-intercept is common to be equal to c.
Therefore, we have solutions at x = 3, and x = -3. We can verify it similarly as we factored above. We know a = 1, b = -6, and c = 9. So are there factors of a * c that are equal to be b? As the simplified form. To figure out the equations of vertical asymptotes, we must look at the original function and determine where x does not exist. It is clear that x =/= 3, because if x = 3, then the denominator will result in 0. Nothing can be divided by zero for our purposes. So the equation of the vertical asymptote is x = 3. 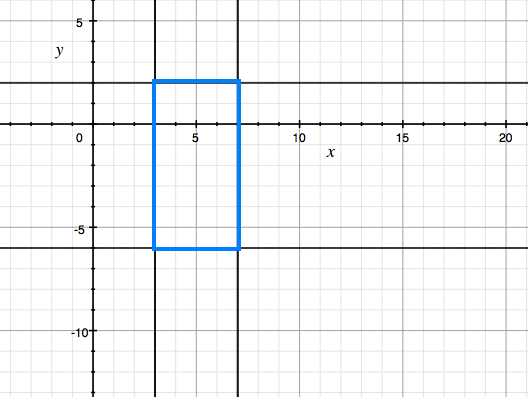 To do this question, let's first draw a diagram for easy visualization and determine what the rectangle should look like. The blue rectangle is formed from the four given lines. To find the area of the rectangle, we will need a length and a width. The length of one of the sides is clearly 7 - 3 = 4. The length of the other side is 2 - (-6) = 8. Thus, 4*8 = 32. You may count the number of miniature 1x1 squares to verify, but it is not practical for larger questions. This question is a basic recall question. You should know the unit circle by heart. You will only ever be expected to know the basic unit circle angles without the use of a calculator. There are two ways to do this question. One way is with the unit circle and with the CAST rule. We know that sinx is positive in quadrants 1 and quadrants 2. We also know that cosx is positive in quadrants 1 and quadrants 4. Hence, sinx = cosx has only one unique solution which is in quadrant 1. This only occurs when x = 45 degrees according to the unit circle. Another way of doing this is algebraically, though some answers may be missed. And convert the left side to cot(x) and we've proven the identity. Remember that the domain refers to all possibly values for which a function can exist. A lot of these are just a look and state sort of questions, however, the use of limits in the future will be necessary to solve harder and more complex function domains. Note that the square-bracket corresponds to the less-than-or-equal OR greater-than-or-equal symbols, while the circle bracket corresponds to the less-than or greater-than symbols. Also note that the square bracket implies inclusion, while the round bracket does not. There is NEVER a square bracket on positive infinity or negative infinity. Note that x cannot be 0, but must be greater than zero. Hence, let's set the inside portion of the natural logarithm to zero. Thus, we know that when x = 1.5, then the inside of the natural logarithm is zero. Hence the domain does not include 1.5 or any values less than 1.5 and can be written in interval notation in the following. Once again, pay attention to the type of brackets! Both are round brackets this time. We will not bother to show the inequality notation because it is a bit redundant. These summation of the logs on the right side should be easy now to compute. Now we should be familiar that e^x and ln(x) are inverses of each other, hence, x = 25.